Garcia vs Porter - where and when? 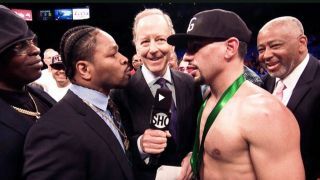 Danny Garcia and Shawn Porter lock horns at the Barclays Center in New York on Saturday, September 8. The action is set to get underway at 9pm local time, which is 6pm PT and 2am Sunday BST. The eyes of the boxing world fix on New York this weekend as Danny Garcia takes on Shawn Porter, but you don't need to be at the Barclays Center to watch it live as we've rounded up the ways you can live stream the fight from wherever you are in the world. With the vacant WBC World Championship on the line, this all-American face-off is expected to be closely fought and high on quality. Garcia enters the bout with a record of 34 wins (20 by KO), 1 draw and 1 defeat. This edges Porter who has two defeats to his name, along with 28 career victories (17 by KO) and a single draw. Having both suffered narrow defeats at the hands Keith Thurman, Garcia and Porter have been seeking to regain their momentum and it's so far so good for each fighter. Garcia scored an 8th round KO victory against Brandon Rios in February, while Porter has seen off Andre Berto and Adrian Granados since falling to Thurman. Don't miss out on this intriguing match-up – follow the instructions below to find out how you can live stream the whole Garcia vs Porter bout via your TV or a subscription service, and perhaps with the addition of a VPN if the country where you are isn't showing the fight. If you've got a Showtime subscription in the US, this is the best way for you to watch the Garcia vs Porter fight. It won't cost you any extra and you'll find it in all the normal places you watch Showtime. If you don't subscribe already, there's a seven day FREE trial but you'll need a US registered payment card to be able to use that. After the seven days it'll cost $10.99 a month, so be sure to cancel it if you don't want to keep it going. The UK broadcaster for Garcia vs Porter is boxing specialist, BoxNation. The service is available for £12 per month and can be added as an extension to your satellite TV package. The subscription will also enable you to stream it via Box Nation on the web, or via its Apple, Android and Amazon app if you want to watch the fight on your phone or tablet. You can also connect to Box Nation via Apple TV and Amazon Fire TV. With the fight taking place over in the Big Apple, its a late/early 2am start for UK viewers.